A new Floor Jansen project? No official details yet, but apparently it's a classic rock project. "Its closer to classic rock " - this means she sounds more like in the video Eilenna posted here ? Floor already lives in Sweden. How much further North does she intend to go? Will there be polar bears involved? Looking forward to her Artic musical expedition! It's not fair! You lot Always get the news 12 hours earlier than we do! Which magazine is the scan from? 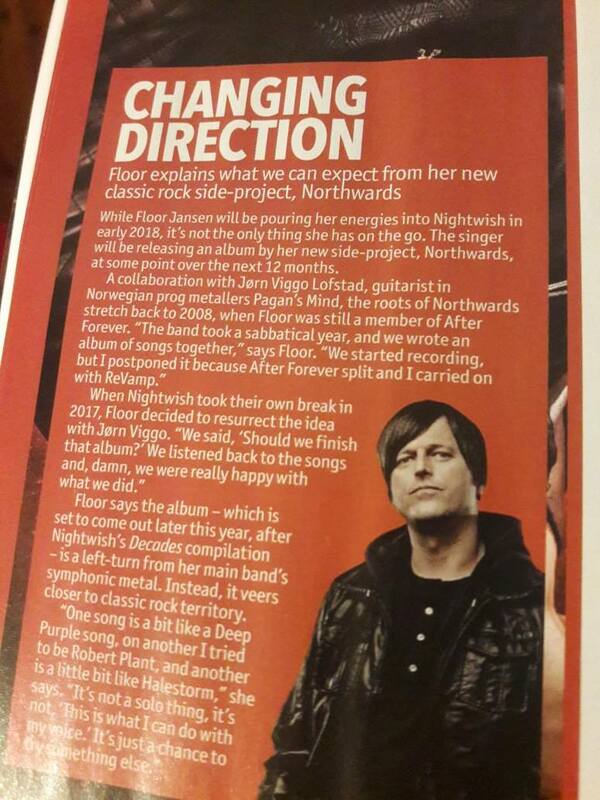 Its from the current Metal Hammer. Now this is interesting! Screw the Deacades tour, Floor I want this out NOW! If it's in the veins of the Judas cover and there's some Halestorm influece as she mentioned, it'll be awesome. I would rather this than the Decades tour for sure. I am happy that there is something of her own creation moving, she is fine in Nightwish, but I still think her strength as a artist equally flows from her own writing. I would love to hear what she has mulled over and written about over the years. It would great to see her cover many profound topics as she did in After Forever. Shut up and take my money, my house and everything I've got. I want this. It's so exciting she is doing her own music again. Can't wait for this album to came out, even more because it's influenced by Halestorm and Judas Priest. That's awesome! Also, I wouldn't mind if she did some touring performing Northwards plus the best ones from AF and ReVamp. It would be satisfying for the fans who accompanied her work in those bands. Yes, you explained that perfectly. Floor's Decades in demand right now! A Floor & Irene duet is more than I was hoping for, that’s for sure! I’m now officially PUMPED for this album! Led Zeppelin influences? My interest is piqued. I'm just glad there is something to look forward to creative-wise from Floor. The mention of Led Zeppelin influences is certainly different. I think a 70s rock album would be a welcome notch on her badass belt. I have this incredible image of this sounding like early Heart, that would put me over the moon. ZOMG, Jørn Viggo Lofstad is Floor´s Joko Ono/Troy/Marcelo!!!! He´s gonna drain all creative energy from Floor, and she´s gonna be like Edema Ruh all the time when in Nightwish!!!! NW is doomed!!!! And I told you that first. In this topic, at least. And then in response, Tuomas will rub his hands and make AURI his main project at Troy's council and all of the band members will be respectively free from his silent iron fist! Now there will be a bunch of side projects intstead everywhere, o nos! Beyond stoked for this project. You are so wrong! Lofstad is Troy! Have you ever seen them together? No! Troy wants to make a side-project with every NW member so he can become a millionaire. I'm telling you in the next six months or so Marco is conveniently going to announce he has teamed up with some other musician and they will be making a bongo side-project. You heard it here first! A simple request, can this topic be free from the Yoko Ono spamming? Yes to no more Yoko Ono. Can't bear that name already for more than 40 years! Well, well, the words 'Led' and 'Zeppelin' did it really. I'm now officialy looking forward to where this is going. I would be already satisfied if she did a cover of 'When the levee breaks'.